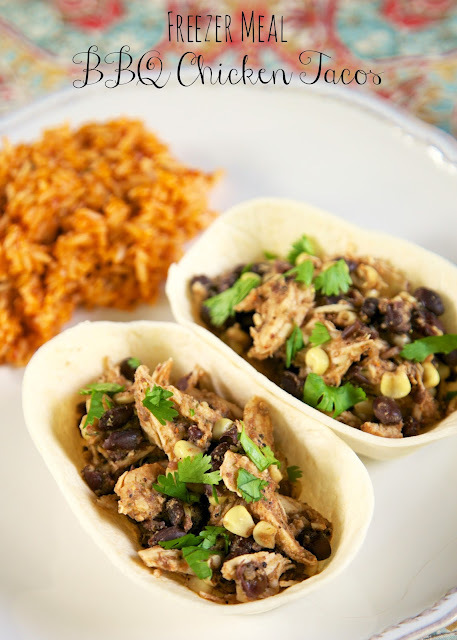 BBQ Chicken Tacos Freezer Meal Recipe - chicken, bbq seasoning, garlic seasoning, black beans, corn, tortillas. Throw everything in a freezer bag and freeze for later. Cook from frozen in the slow cooker. SO good! Welcome to week two of our freezer meal series! If you missed last weeks meals, you can check them out here: Day One, Day Two, Day Three, Day Four. Now for today's recipe, BBQ Chicken Tacos. We really, really, really liked these tacos! They are SO good. I loved the BBQ seasoning in the meat. It gives the chicken an unexpected smoky flavor. We used the new Stand 'N Stuff soft taco shells. We loved them. I preferred them to regular tortillas. This makes a lot of shredded chicken. We ate these for lunch the next day and thought the meat was even better. This recipe is a keeper! Place first 7 ingredients in gallon ziplock freezer bag. Freeze. To prepare: Place contents of freezer bag in slow cooker. Cook on LOW for 6 hours. Shred chicken. 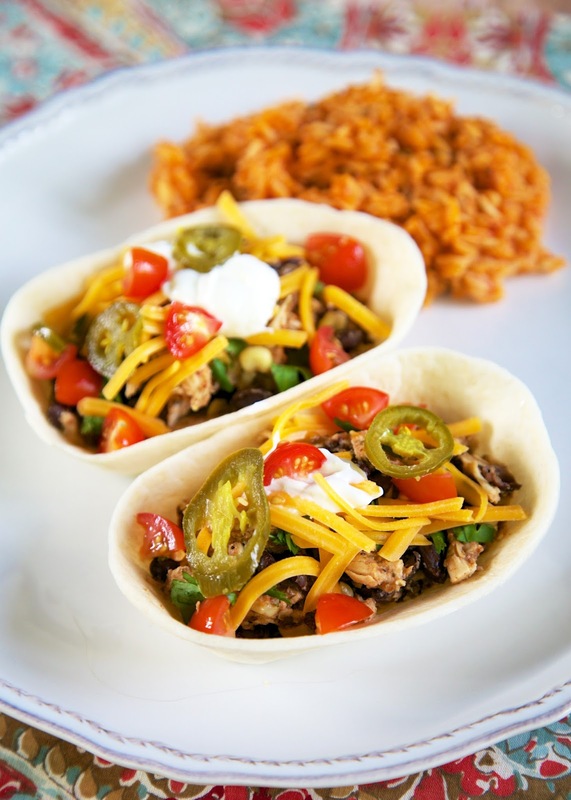 Place chicken in tortillas and top with favorite toppings. I did not defrost before cooking. Do you defrost the chicken before combining ingredients? Thank you so much for your easy and delicious freezer and crock pot meals! I work for a small transitional homeless facility for single women with children. I am including some of your meals in our life skills classes for preparing freezer meals! Thank you for making such easy to follow and basic ingredient tasty meals! We used large cans of chicken for our meal, 3 cans (3 servings each) in place of the 2# chicken.